Prince George's County fire officials say 26 people have been displaced from their homes after an apartment fire in Hyattsville. 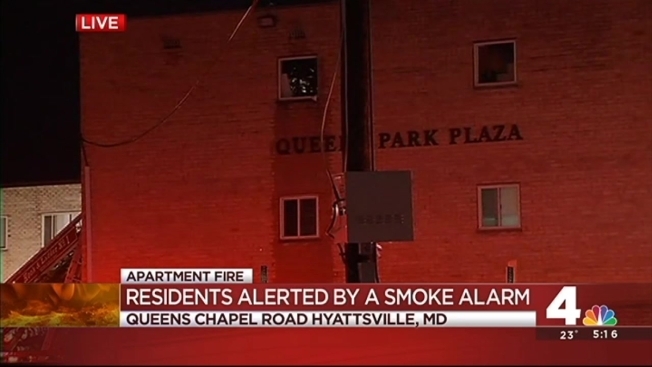 The fire broke out early Friday at an apartment building on Queens Chapel Road. Fire department spokesman Mark Brady tweets that the fire was quickly extinguished and no injuries were reported. Fire Chief Marc Bashoor tweeted that a smoke alarm alerted residents of the fire. He says firefighters used ladders to rescue residents from the third floor and all residents are safe. Bashoor says the residents of 15 units _ 20 adults and six children _ are displaced because the apartments lack utilities. Officials say the Red Cross is helping the displaced residents.